You can find Krystn Parmley on Facebook. Krystn Parmley is following her bliss. Parmley, 22, is taking a huge leap of faith. A single mother, she understands the importance of steady income. She considered getting into the field of medicine but she decided instead to follow her heart. To Parmley, art is worth it. Parmley grew up in Spokane Valley and attended East Valley High School where she took a couple of semesters of art. She went on to Spokane Falls Community College and is studying at Eastern Washington University. 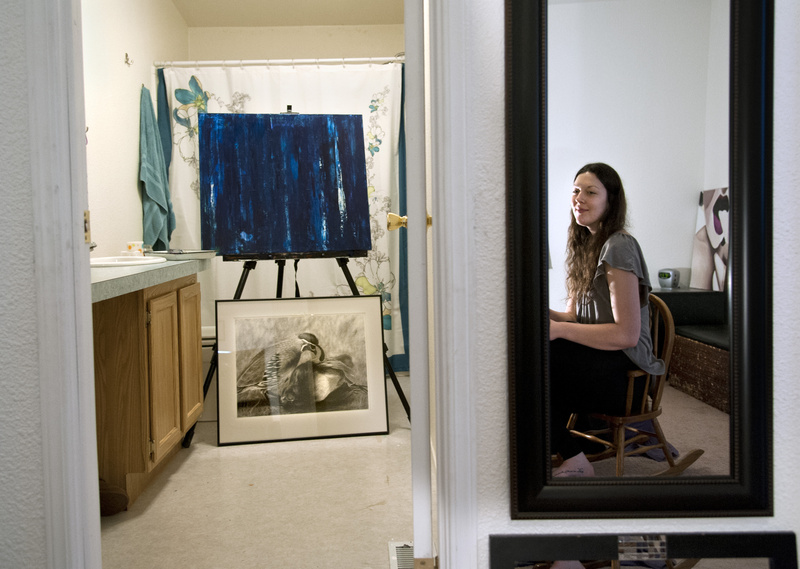 Eventually, she hopes to earn a master’s degree and teach art at a college. Parmley lives in Otis Orchards with her 4-year-old daughter. She creates art in her bedroom or in her large bathroom where she sets up an easel and takes advantage of good lighting and a sink. She draws with pencil, ink or charcoal, sometimes paints in acrylic, and does printing and relief work. From organic abstracts resembling things like roots and webs or cracks, to stunning figurative pieces and still lifes, her work represents feelings, ideas, thoughts and memorable images she stumbles across. For example, her piece “Waiting” was inspired by two quail that she saw on the side of the road.